NASA astronaut Scott Kelly is spending a year in space during his Expedition 44 mission to the International Space Station. Kelly and Russian cosmonaut Mikhail Kornienko are flying the yearlong space mission to study the effects of long-term spaceflight on the human body. NASA astronaut Scott Kelly on the International Space Station (via video at top) waves while talking with reporters at the National Press Club in Washington, D.C. on Sept. 14, 2015 during a discussion of his one-year space mission. Kelly's identical twin brother Mark Kelly (a former NASA astronaut) sits at center, with National Press Club president John Hughs at left and astronaut Terry Virts at right. "I feel pretty good overall," Kelly said Monday (Sept. 14) in an in-flight interview on NASA TV. "I definitely recognize that I've been up here a long time and have just as long ahead of me. But I feel positive about it." 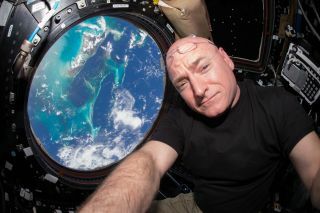 Kelly added that he has consciously paced himself more slowly on this mission than on his last trip into orbit, which put him on the orbiting laboratory for 159 days. "I intentionally thought about ways for me to get to the end of this with as much energy as I had in the beginning," Kelly said. "I intentionally don't work at the same pace I did last time I was up here, when I felt like I could go at 100 percent speed for the full six months. I can't do that. So I consciously try to throttle myself back at certain times and have a really good balance between work and rest. And that's what I would encourage anyone who attempts to spend this amount of time in this type of environment, is you just have to pace yourself." If humans were to take a trip to Mars using near-future technology, the journey would likely take more than one year each way. While Kelly and Kornienko are not the first astronauts to surpass six months in space — five Russian cosmonauts have spent more than a year in orbit — relatively little scientific study has been done on those long-term space travelers. With the one-year mission, scientists will get their hands on a massive haul of data revealing the physical effects of long-duration spaceflight. Ultimately, this may help scientists understand how to assist and protect astronauts going to Mars or beyond. NASA astronaut Scott Kelly (right) and Russian cosmonaut Mikhail Kornienko on the International Space Station speak with members of the press via a video link on Monday, Sept. 14, 2015. Tuesday (Sept. 15) marks the halfway point of their one-year mission, which will keep them on the station until March 2016. While the results of the scientific studies on Kelly and Kornienko will not be revealed until after the mission is over, Kelly said he has taken note of how his body has adjusted to life in microgravity. He said spending a long time aboard the station means that he continues to adapt. "So far, I've found that it is a continuous thing," Kelly said. "It gets less significant over time, but I do notice that I can do things now that I couldn't do right when I first got up here, even though I had flown 180 days in space before. My ability to move around is really improved over time and continues to improve. And, you know, you just get more comfortable. Your clarity of thought is greater. Your ability to focus. Things like that. I have found that the adaptation has not stopped. And it'll be interesting to see where I'm at six months from now." While a one-year mission on the International Space Station is no easy task, it is certainly very different from a trip to Mars. Space travelers on a journey to the Red Planet would travel through millions of miles of empty space, far from home and locked up with the same group of people for the entire trip. The astronauts on the orbiting station have it somewhat easier: They can see Earth. They have a relatively quick way to get home if the need arises, and their crewmates change from time to time. But Kelly and Kornienko will experience some of the mental strain of a Mars mission while they are on the station, including not being able to go outside (except during spacewalks, which aren't exactly a walk in the park). "This is a very closed environment. We can never leave. The lighting's always pretty much the same — the smells, the sounds, everything's the same," Kelly said yesterday. "I think even most prisoners can get outside occasionally in a week. But we can't. And that's what I miss, after people." A year in space means a year away from the supermarket. Here, NASA astronaut Scott Kelly poses with a delivery of fresh fruit on the International Space Station that arrived in late August on a Japanese cargo ship. In the Sept. 8 interview, Kelly was asked what he thought might be the difference between his mindset at the halfway point of the one-year mission, and the mindset of some future crew reaching a halfway point on a journey to Mars. "I think for the folks who go to Mars, especially the first time, that's going to be such an incredible destination and event that they're going to be really psyched up for getting there," Kelly said. "And I'm not saying I'm not psyched up for the rest of this, but in some ways, almost being halfway through, a lot of what we're going to be doing is going to be similar to what we've already done. And we have a person here […] who is getting ready to leave us — Gennady [Padalka]. And that obviously wouldn't happen on [a journey to] Mars. That makes it a little bit different — people coming and going. So I think it's hard to compare the two experiences, but man I'm excited for the folks who get to go to Mars someday."